I remember the first time I saw THE LITTLE MERMAID. The VHS had just been released, I was 19 years old and babysitting the kids across the street. 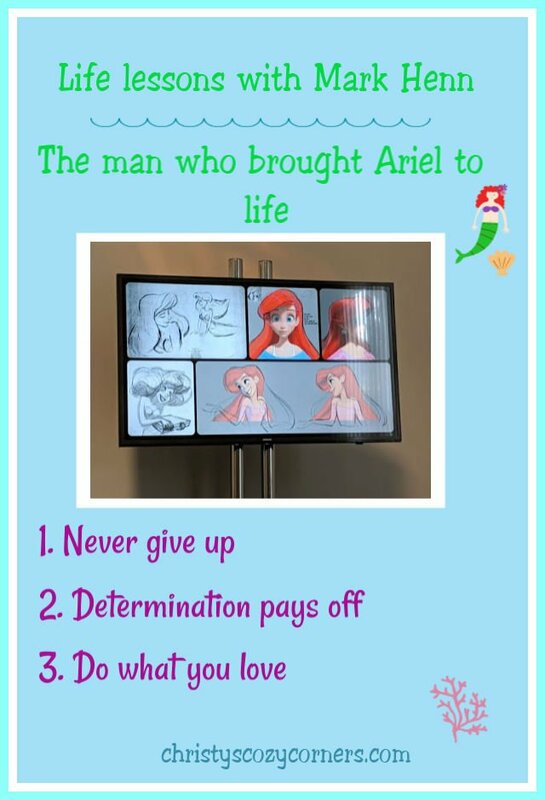 Never in a million years would I have thought I’d have the privilege of meeting the man who brought Ariel to life. Meeting Mark Henn was a joy and not just because he’s from Ohio (Go Buckeyes!). Mark Henn has been with Disney for almost 39 years. He gives credit to his mom for encouraging his art since she first gave him a pencil and paper in church to keep him quiet! Both of his parents were teachers, and though they didn’t discourage him from art, they didn’t push him either way. When Mark got to college, he got more serious about art. And since it was his boyhood dream to work for Disney, after a year of attending Bowling Green he put together a portfolio and sent it to the studio. They told him he showed potential, but they didn’t accept or reject him. Disney told him what he needed to do to improve. After the year at Bowling Green, Mark planned to transfer to Ohio State University since they had such a great art program. That plan didn’t pan out as Mark had surgery between his freshman and sophomore years and was unable to attend. His dad suggested that he attend the local junior college, and he did since it was local and easily accessible. He took many art classes that year and sent a second portfolio to Disney. They again told him to stay in school, so he did another semester and sent a third portfolio. Mark told us that he’ll never forget that third letter, and what it said. The letter said, it wasn’t that he wasn’t a good artist. It was that they thought he didn’t have what it took to travel the narrow roads that Disney animators travel. Mark Henn didn’t give up. That’s one thing that sticks with me about him. His determination led him to apply to CalArts, and he was accepted. At the end of his second year at CalArts, the studio hired him. What would have happened had he given up after that first rejection letter? We wouldn’t have THE Ariel (or many other character’s Mark’s worked on) that we know and love. Don’t give up on your dreams. You never know where they may lead you. 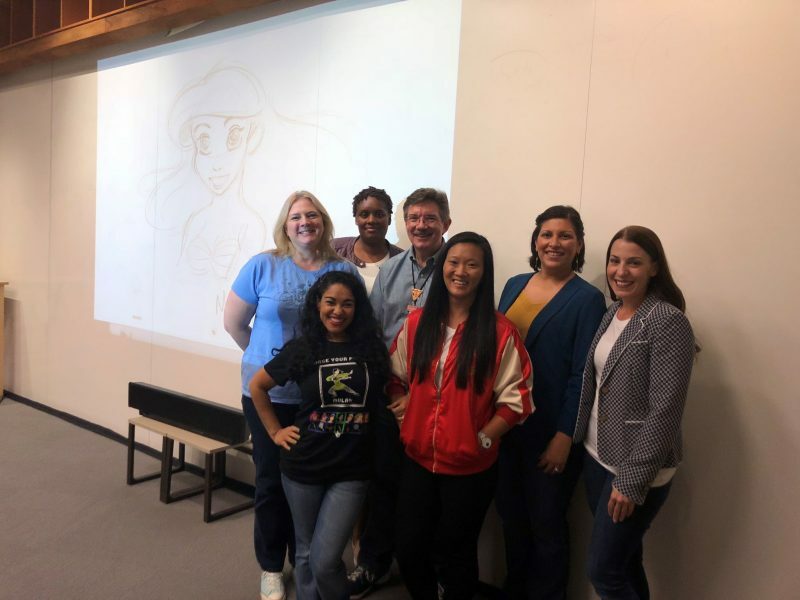 For RALPH BREAKS THE INTERNET, Mark Henn was responsible for about half of the princesses in the Oh My Disney! sequence. Of course, Ariel is part of that sequence. Mark wanted to make sure that Ariel was still Ariel, and he was part of the testing that made sure that she moved like she was supposed to move as well as looked the way she was supposed to look. 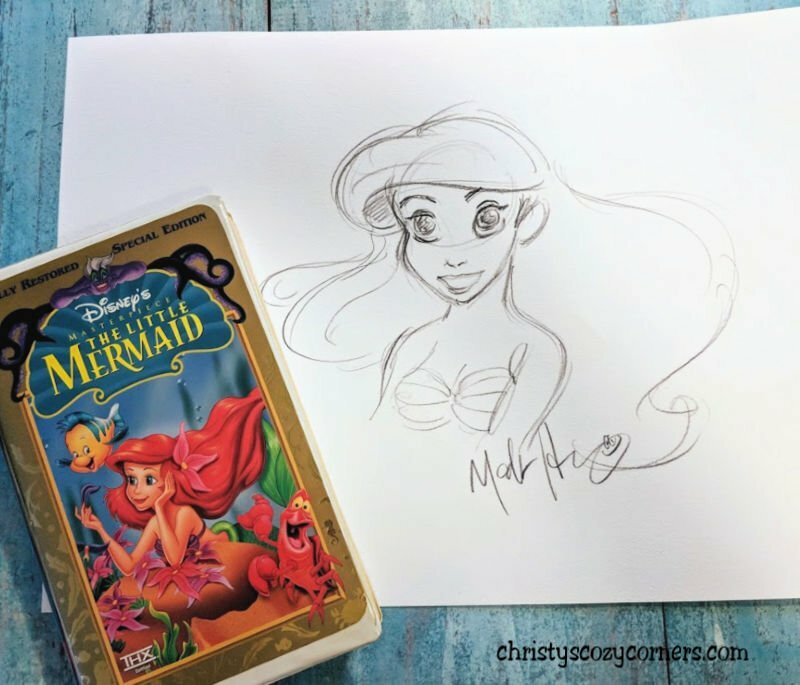 We asked him if he’d drawn Ariel in the years that have passed since its release in 1989. He told us that the last time he’d drawn her was for a McDonald’s commercial shortly after THE LITTLE MERMAID‘s release! That is a lot of years! 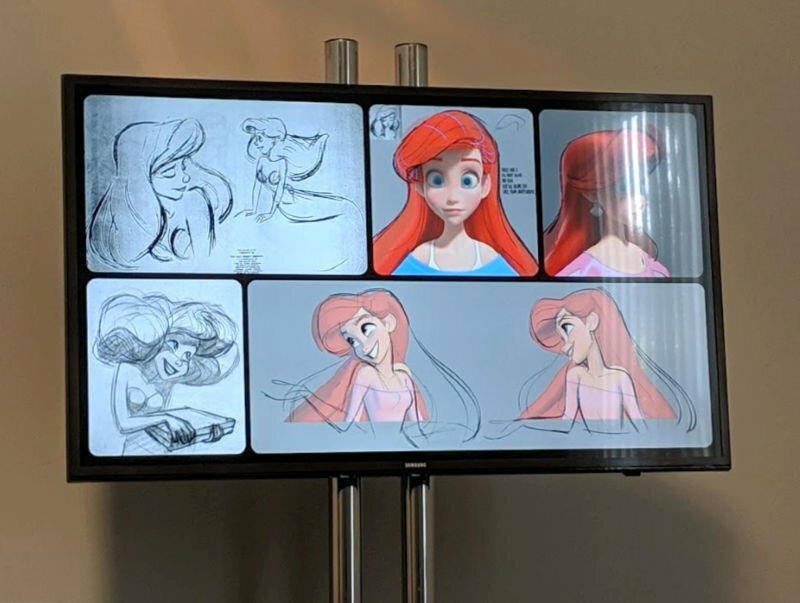 Watching him draw Ariel in our session with him was a once in a lifetime experience that I will never forget. Yes, this is a VHS tape! I have been so blessed to be a part of this Disney family and get opportunities like this. Mark Henn is such an inspiration. He taught me these lessons: never give up, getting where you want to be takes determination and hard work, and do what you love. These lessons can breathe new life into all of us if we remember them every day. Go out and live your best life! 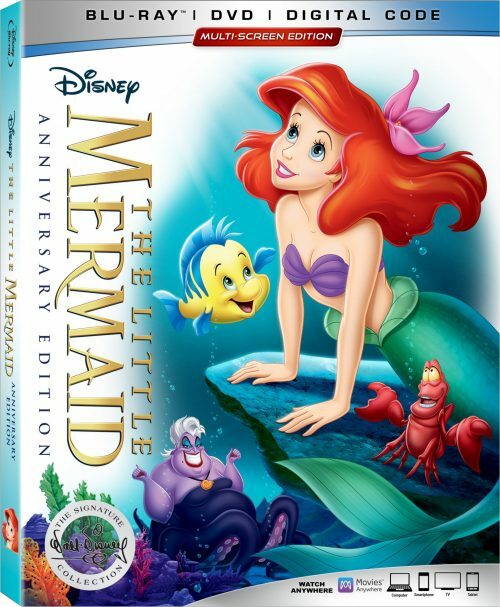 THE LITTLE MERMAID dives into the Walt Disney Signature Collection on Digital, 4K Ultra HD and Movies Anywhere TODAY, Feb. 12 and 4K Ultra HD and Blu-ray™ on Feb. 26! What an amazing opportunity to interview him. He seems like a very dedicated person who loves what he does. He definitely is! He was so nice and down-to-earth. I really appreciated hearing how hard he worked to get where he is.